Georgii Rickey Quattuor quadra quadruplicia (1969). Xystus Pinacothecae Nationalis Novae, Berolini. Rickey sculptor kineticus habetur. Naum Gabo Costructio kinetica, etiam Unda stans appellata (1919-1920). Edgari Degas Ad certamina (1877–1880), oleum in textili. Museum Orsay Lutetiae. Edgari Degas Orchestra operatica (1868). Claudii Monet Officina supra Sequanam (1876). Ars kinetica est ars in ullo medio artifice motionem continens quae a spectatore percipi potest, vel cuius effectum motu innititur. Picturae in textili quae conspectum motusque in multis dimensionibus comprehendunt sunt prima artis kineticae exempla. Ars kinetica in sculptura trium dimensionum aliisque figuris hodie consistit, sicut mobilibus, quae naturaliter vel per machinas moventur. Earum partes moventes plerumque vento, motro, vel a spectatore cientur. Ars kinetica variissimas technicas rationes modosque comprehendit. Lyman Whitaker The Twister Star Huge, sculptura generis whirligig. Iesu Raphaelis Soto Sphaera. Caracis Venetiolae. Davidis Ascalon Alae ad caelis (2008). Aluminium et chalybs. Temple Israel Memphide Tennesiae. Fons sitularum. Wellingtoniae Novae Zelandiae. Angelae Conner Unda. Park West Dublini. Nicolai Schoeffer Chronos 10B (1980). Monaci. Marci van den Broek Sun Writer (1986). Germania. Turpin + Crawford Studio, Halo. Sydneii Australiae. Uli Aschenborn Sculpture-Morph, cuius umbra 'Male Life Cycle monstrat. Namibia. Uli Aschenborn Living Drawing. Oculi spectatorem sequuntur. Namibia. Uli Aschenborn Leo aggrediens, res e tribus partibus visa (colores mutantur). Namibia. Uli Aschenborn Aleae magicae, res e tribus partibus visa (colores mutantur). Namibia. Uli Aschenborn Morph-Cube, quod piscem mutantem e tribus angulis monstrat. Namibia. Sarnikoff Goldflakes, mobile a motro asynchrono animatum. Francia. 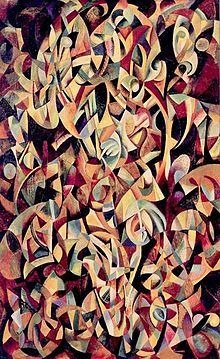 Alexandri Rodchenko Saltatio: compositio rebus carens (1915). Alexandri Calder Mobile Rubrum (1956), metallum laminarie pictum et virgulae metallicae, magnum opus. Museum Bellarum Artium Montis Regii. Bott Casper, Gian. 2012. Tatlin: Art for a New World. Hatje Cantz Verlag GmbH & Co KG. ISBN 9783775733632. Diehl, Gaston. 1972. Vasarely. Conv. e Francico ab Eileen B. Hennessy. Novi Eboraci: Crown Publishing Group. ISBN 9780517508008. Marks, Mickey K. 1972. Op-Tricks: Creating Kinetic Art. Lippincott Williams & Wilkins. ISBN 9780397312177. Milner, John. 2009. Rodchenko: Design. Woodbridge: Antique Collector's Club. ISBN 9781851495917. Popper, Frank. 1968. The Origins and Development of Kinetic Art. Conversus e Francogallico e Stephen Bann. Londinii: Studio Vista. ISBN 0289795923. Selz, Peter Howard. 1984. Theories of Modern Art: A Source Book by Artists and Critics. University of California Press. ISBN 9780520052567. Selz, Peter Howard, Collette Chattopadhyay, et Diane Ghirado. 2009. Fletcher Benton: The Kinetic Years. Hudson Hills Press. ISBN 9781555952952. Terraroli, Valerio. 2008. The Birth of Contemporary Art: 1946-1968. Rizzoli Publishing. ISBN 9788861301948. Tovey, John. 1971. The Technique of Kinetic Art. David and Charles. ISBN 9780713425185. Toynton, Evelyn. 2012. Jackson Pollock. Portu Novo: Yale University Press. ISBN 9780300192506. Vicimedia Communia plura habent quae ad artem kineticam spectant. International Kinetic Art Exhibit and Symposium: Boynton Beach, Florida. Novissima mutatio die 16 Decembris 2018 hora 21:26 facta.